1. When you smoke marijuana, you get the munchies. 2. When you get the munchies, you eat food. 3. When you eat food, you gain weight. 4. So, the act of smoking marijuana causes you to gain weight. Now, when you smoke a gram of marijuana it is more than likely that you will increase your weight by much more than just one gram. The munchies will cause you to eat, and the cotton mouth will cause you to quench your thirst. Both actions will lead to an increase in your body weight. And, you will now have to smoke the same weight in marijuana as the food and water you just ingested. This process is often cyclical, but will never lead to an overdose. Eventually you will simply go to sleep. Additionally, if you can afford your weight in marijuana or possess your weight in marijuana, please contact us immediately. PS: Watch this video about a police officer who baked pot brownies from weed he confiscated, and thought he had overdosed on pot. 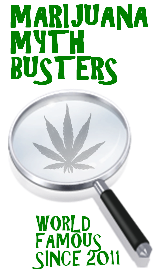 As many of you may or may not know, we have quite a few economists amongst the ranks at Marijuana Myth Busters. The field of economics is full of stoners of all ages; from students to professors, put simply economists like pot. And, as you might guess there is quite a bit of economic research out there on the marijuana industry. After conducting our own research we cam across a local drug dealer who made an interesting point. He said that his reason for selling marijuana was motivated solely by two things. The first being that as a drug dealer he could essentially “smoke for free”, although in reality he is only smoking at a far reduced cost. And, the second motivating factor was of course money. He went on to say that he was so motivated by money in selling marijuana that he would prefer if it stayed illegal, because as an illegal substance he could charge more money for it. This story truly represents the problem that arises form marijuana being illegal. If every drug dealer was as smart as ours, they would all want marijuana to stay illegal. Most drug dealers make a decent amount of money, which they would not be able to do if it was legalized. Who amongst us would buy barely a gram off the street for $20 when you would be able to get an actual gram of higher quality bud in a store for $10? The consumers are really being hurt by the current structure of the market for marijuana. But, the government is losing out too. If marijuana was legalized and taxed it is estimated that the price to the consumer after any and all taxes will be at most 50% of the current street prices. As a $25 billion per year, if not more, industry marijuana represents the largest tax loophole in history. For as much as we may hate them, the government is truly missing out on the opportunity to raise money for schools, to create legitimate jobs, and fund other programs and facilitate other opportunities for the public. Allowing farmers to grow marijuana would increase the profitability of farmers and farm land in America. In recent years many farms have gone into foreclosure not only causing serious financial burdens for farmers, but also putting a strain on the domestic supply of food for our country. The only people who benefit off of marijuana being illegal now are the growers and distributors. If you are one, sorry for all the hate. Been there and done that ourselves, everyone needs to start somewhere. But, everyone will benefit from its legalization. If you support the legalization of marijuana, leave a comment below and let us know what you think. Until then be like an economist, and keep your head in the clouds. So if you’ve read the about page you know what this site is about. And, if not here’s the deal. What we are trying to achieve here is setting the record straight on all myths related to marijuana. The site is still under construction as we speak, but we figured it would be best to start letting the myths come in. Just reply to this comment with a myth about marijuana that you would like to see busted and we will go figure out whether the myth is true or busted. The results of our findings we will put into a video and post back up on the site for all to see. If you can somehow bust a myth that we cannot, we will bring you on as a member of our team. So… let’s see what you’ve got for us.